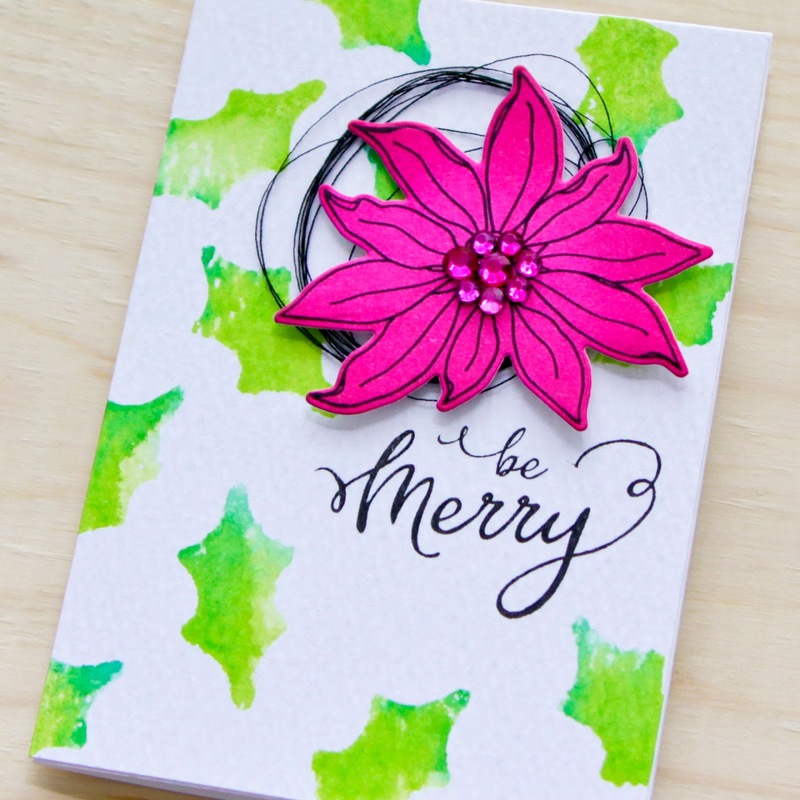 i'm a little in love with the poinsettias by julie ebersole for the essentials by ellen clear stamps mondo poinsettia set. -i started with a 3.5 x 5 piece of watercolor paper and stamped my sentiment with versafine onyx black. 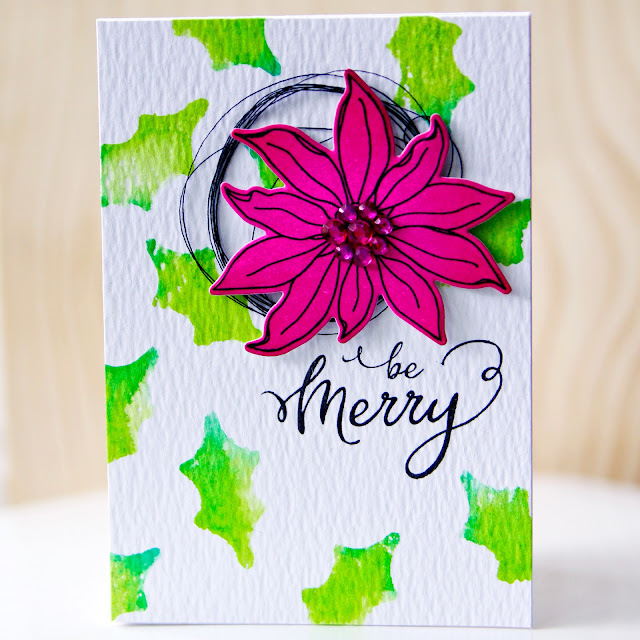 -to create the holly background, i used the "wrong" side of the stamp on the acrylic block. i inked in with twisted citron distress ink and then added a little bit of peacock feathers on the edge. 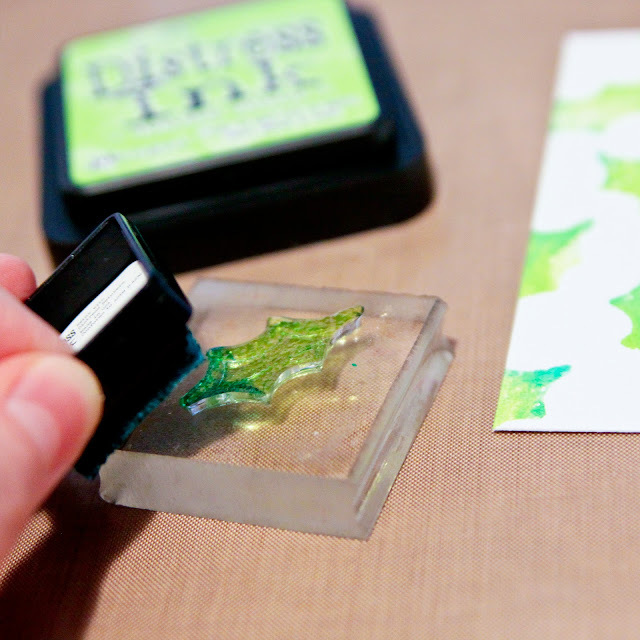 once my stamp was well-inked, i misted the stamp with water and stamped. the distress ink and mist give a fun watercolored look. -i used picked raspberry distress ink and an ink blending tool on solar white cardstock. once i had the pink shade i was going for, i stamped the small poinsettia from the essentials by ellen clear stamps mondo poinsettia and die cut with the coordinating die. -i used copic marker fuchsia rv09 to color clear rhinestones to match my poinsettia but pink rhinestones would work nicely too. -i used some black thread behind my poinsettia and foam tape to 3d mount it to my card. and i adhered the whole panel to a 3.5 x 5 card. so pretty! I'm looking forward to crafting again after vaca!